‘White Ghost’ takes the win! Winning chefs Michael Raines (left) and Ken Crawford. Michael Raines and Pastor Ken Crawford brought home the blues with “Sweet Red Pepper,” Michael’s winner in the traditional category and Ken’s “White Ghost” concoction, which took the most creative category. I asked these lay potagers if they had any words of advice for great chili making. Michael revealed that he bought his meat for the traditional chili at local Dallas institution, Jimmy’s Food Store. Ken shared his winning recipe for creative chili (a vegetarian offering) and it follows this article. The real winners were, of course, the church members and guests who got to sample 10 delicious pots of red and hot-from-the-kitchen hush puppies by Frank Whitington. The cook-off may not compete with the history or prestige of the Terlingua Chili Cook-Off, hailed as the granddaddy of them all, but it’s food, fun and fellowship with roots in Central Christian Church. 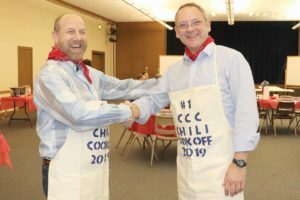 Named after long-time member and two-time chili winner, the late John Shinn, the annual cook-off is another way to celebrate love, now and then, and the memories created at Central. Sunday worship is at 11 a.m. on Sunday mornings, and church in the dog park is at 9 a.m. the first and third Sundays of the month. Add beans, broth and 1/2 bean juice to crockpot with pot on high. Sauté potato and garlic in avocado oil till browned. Add 1/2 chili mix to bean and 1/2 to potatoes. Transfer potatoes to crock pot. Deglaze potato pan with beer and boil off alcohol. Add to crock pot and simmer.